Under Sections 295 B and 205-C of the Pakistan Penal Code, anyone who desecrates the Qur‘an or defiles the name of the prophet Muhammad is punished with death or life imprisonment. Implemented in 1986 by then dictator, General Zia-ul-Haq, to woo the country’s fundamentalist faction, the laws have become a tool to persecute religious minorities and even Muslims. Almost a thousand people have been charged so far under the law, and hundreds have become its victims. Islamabad (AsiaNews) – Pakistan’s blasphemy laws are the country’s worst instruments for religious repression. According to data collected by the Catholic Church’s National Commission on Justice and Peace (NCJP), at least 964 people have been indicted for desecrating the Qur‘an or defiling the name of the prophet Muhammad between 1986 and this year, including 479 Muslims, 119 Christians, 340 Ahmadis, 14 Hindus and 10 from other religions. Since its inception, the law has been used a pretext for attacks, personal vendettas and extra-judicial murders: 33 in all by individuals or enraged mobs. Since 2001, at least 50 Christians have been killed after being accused of blasphemy, the NCJP said. The list of victims of Muslim extremists also includes members of other religious minorities as well as Muslims. The Ahmadi community—a Muslim group that does not view Muhammad as the final prophet and is thus deemed heretical by Sunnis and Shias—has lamented the loss of at least 12 of its members this year. Since 1984, 107 Ahmadis have been murdered and 719 arrested. 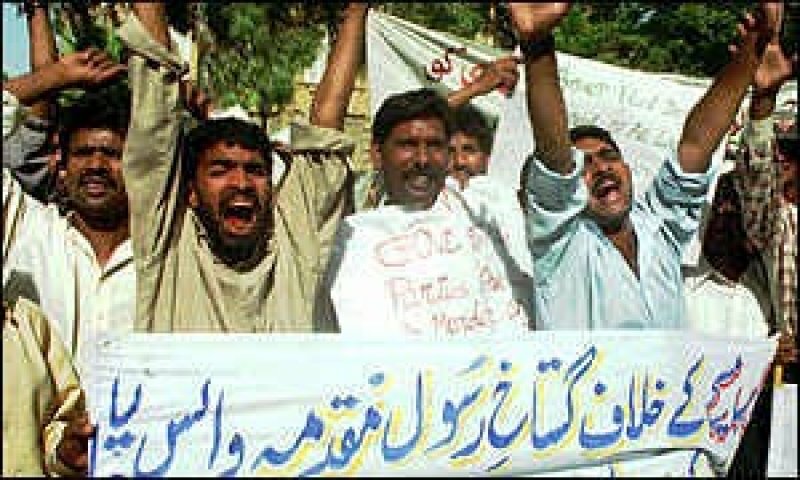 Blasphemy laws were introduced in 1986 by then dictator Zia-ul-Haq to protect Islam and its prophet, Muhammad, from insults and slander. However, over time it has become an instrument of discrimination and violence. The laws are actually sections 295-B and 295-C of the Pakistan Penal Code, which respectively sentence anyone who desecrates the Qur‘an or defiles the name of the prophet Muhammad to life imprisonment or death. Charges against alleged blasphemers are often trumpeted up or motivated by malicious interests, ending in scandals that drive enraged mobs to seek justice on their own. Even if someone is arrested because of a single witness, the unfortunate suspect could become victim of police torture and violence. In many cases, under the pressure of mobs stirred by local mullahs, judges have inflicted death penalties without a shred of evidence against defendants. Together with the Hudood ordinances—Qur‘an-inspired rules that impose flogging and stoning on actions deemed incompatible with Islamic law like adultery, gambling, drinking—,blasphemy laws are an example of extreme sectarian and fundamentalist legislation. Over time, they have contributed to the radical Islamisation of the country. A police agent killed Samuel Masih in 2004 in a Lahore hospital. Mr Masih had been indicted on 23 August 2003 on the basis of Article 295 of the Pakistan Penal Code, for an offence punishable with up to two years in prison. According to the prosecution, the dead mad had allegedly sullied the wall of a mosque. Masih, who had been suffering from tuberculosis, was admitted in hospital on 21 May 2004. The next day, Fara Ali, the police agent charged with his security, hit him on the head with a chisel. Samuel Masih died on 28 May 2008 at Lahore General Hospital. Muhammad Yousaf Ali, a Muslim, was shot to death on 11 June 2002 in Kot Lakhpat Prison, in Lahore, by Tariq Mota, a fellow prisoner and a member of Anjaman-e-Sipahe Sahaba, a banned extremist group. 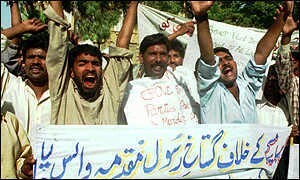 Yousaf Ali, 55, had been sentenced to death for blasphemy on 5 August 2000. Tharik-I-Khatmi Nabuwat, a Lahore-based Islamic extremist group, had originally reported the victim to the authorities. Manzoor Masih, 37, from Gujranwala, was murdered by armed militants on 5 April 1994 at the entrance of the High Court building in Lahore. Three Christians were on trial for blasphemy, including Salamat Masih, a 14-year old teenager. The evidence provided by the accusers led the court to believe that since Manzoor Masih and Rehmat Masih were near Salamat, they must have instigated him to write derogatory graffiti on the wall of a mosque. Our overview of the fight against the blasphemy laws cannot leave out of one its prophetic figures, Mgr John Joseph. In his case, the campaign for justice and peace in Pakistan became an all-consuming passion. Appointed bishop of Faisalabad in 1984, the 65-year-old prelate took his own life on 6 May 1998 in front of a courthouse where a young Christian had been convicted for blasphemy. In addition to single individuals, many communities and Christian churches have become the victim of the violence that often follows blasphemy accusations. On 30 July of this year, a mob of 3,000 Muslims attacked the village of Koriyan, setting it on fire to exact punishment for another alleged case of blasphemy. On 1 August, a group of Muslim extremists attacked the village of Gojra, where they killed seven people, including women and children, burnt alive. The history of the last few decades in Pakistan has seen many churches and Christian villages attacked on false blasphemy charges: Kasur (June 2009), Tiasar (Karachi, April 2009), Sangla Hill (2005) and Shantinagar (1997).